Hier finden Sie eine Übersicht an deutschen und internationalen Städten, die aktuell im Bereich Sharing aktiv sind. Sharing-city.de unterstützt Städte dabei, den Sharing-Gedanken in ihrer Community zu fördern. 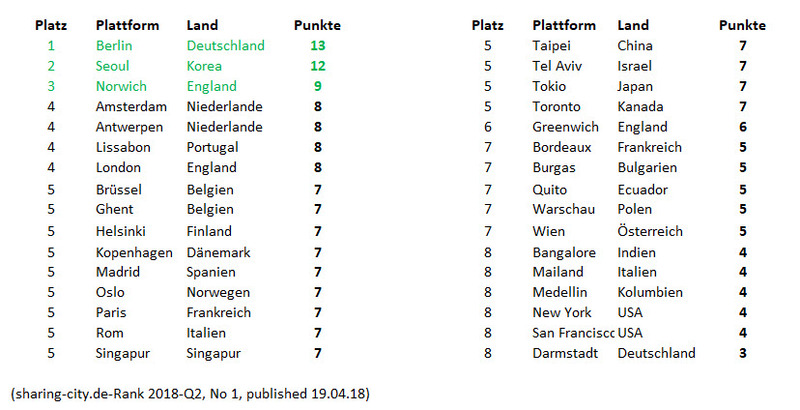 Ranking anzeigen Was ist eine Sharing-City? For a quick and visible change cities may favor to focus on traffic for good reasons. The bicycle makes sense in cities. Investment in biycycle infrastructure is a modern and intelligent move for a city to make. Plenty of research shows the social, economic, environmental and health benefits from urban cycling. Did you know there is an Index which ranks the Top 20 cities engaged in improving the cyclists´ life?